Three decades ago, the socialist/communist economies of Eastern Europe died, not with a bang as many had feared, but with a whimper. It was obvious that the economies of those countries were falling further and further behind their Western Europe counterparts — and that, coupled with the loss of liberty under the heavy thumb of the Soviet Union, was causing increased anger on the part of much of the population. The socialist/communist leaders claimed that their economies were much more prosperous than they were. For instance, the Bulgarians might have claimed that bread was only 5 cents per loaf, but in fact very few loaves of bread were produced and sold by the state bakery at such a price. Most people were forced to buy their bread and almost everything else in the black markets at much higher prices. The result was most people were very poor, with few choices for food, housing and almost everything else. The Soviets had brutally crushed the Hungarian uprising in 1956 and the “Prague Spring” in 1968. In 1985, the Soviets had a new leader, Mikhail Gorbachev, who seemed more reasonable, but was faced with an economy in steep decline. In 1980, the Solidarity trade union was formed at the Gdansk shipyard in Poland. The Polish communist government attempted to repress it, with only partial success, but ultimately that effort resulted in largely free elections in Poland in 1989. Subsequently, uprisings took place in Hungary, Czechoslovakia, East Germany, Bulgaria and Romania — all in late 1989. The Soviet Union dissolved in December 1991, freeing Estonia, Latvia and Lithuania, and other countries that had been under Soviet control. Thirty years ago, the open question was: “Could democracy and free markets be restored after all the years under the communists?” The answer is a resounding “yes,” and a number of those oppressed countries now have a higher standard of living than countries in old Europe, such as Greece and Portugal. 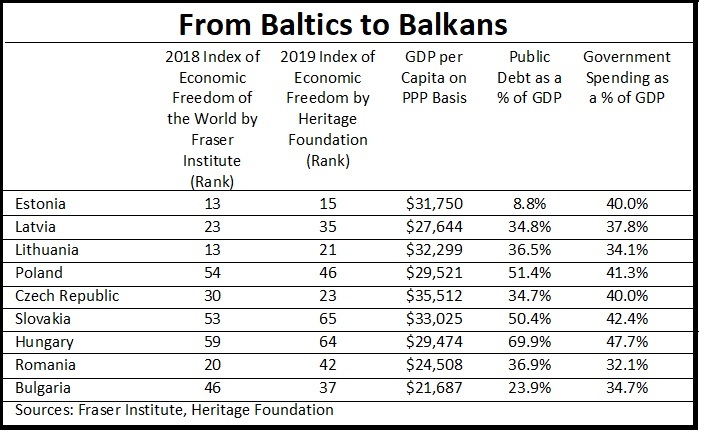 The countries of Eastern Europe, in general, have much lower debt levels than the countries of old Europe, so their growth prospects and ability to weather the decline are also much stronger. The newly freed countries also had, for the most part, a remarkable set of leaders, many of whom I was privileged to know and work with. Mart Laar in Estonia was only 32 years old when he became prime minister in 1992. He had a Ph.D. in history, but, as he has often said, the only economics book he had ever read up to that point was Milton Friedman’s “Free to Choose” — and he liked the policy prescriptions. So that is what the Estonians did. Estonia, as in the past, now looks like a normal Scandinavian country. A remarkably talented economist, Leszek Balcerowicz, emerged out of the ashes of communism in Poland and subsequently became finance minister, head of the Central Bank and deputy prime minister. He also understood that free-market democratic capitalism was the salvation for Poland, and, as a result of his policies, Poland has had the highest growth rate of the large European countries. Several years before Lithuania obtained its independence from the Soviets, several young Lithuanians (including a number of women) set up a free-market think tank. One of the leaders was Elena Leonjeva, followed by Ruta Vainiene. If Lithuania had not obtained its freedom, these women and their colleagues would probably have been sent to a gulag or worse. They had more in common with the American Founders than the bloviators that now inhabit our policy discourse. Vaclav Klaus was a Ph.D. economist, and, despite living in socialist Czechoslovakia, he was able to get his hands on works by Friedman and F.A. Hayek, whom he subsequently got to know when the wall came down. Mr. Klaus ended up at times being finance minister prime minister and president of the Czech Republic. The average Czech lives far better than even many Western Europeans because of the policies Mr. Klaus instituted. Back in 1989, Viktor Orban, the current president of Hungary, formed a political party where only people 35 or younger could be members. At the time, he was a self-described libertarian. Mr. Orban is now criticized for his seemingly growing authoritarian tendencies. The 35-year-old age limit of the party membership requirement unsurprisingly disappeared a couple of decades ago. Bulgaria might seem as an odd place for a group of free-market disciples of Hayek to emerge during the collapse of communism — but that is exactly what happened under the leadership of Krassen Stanchev and Ognian Pishev. Mr. Stanchev and others set up the Institute for Market Economics, which he still chairs. The CEO is a remarkable young woman, Svetla Kostadinova, who was instrumental in the passage of a flat-rate, 10-percent income tax in Bulgaria. Who would have thought? The remarkable transformation of Eastern Europe from a seemingly hopeless, bankrupt and poverty-ridden area to an island of prosperity and liberty shows that no matter how big the economic disaster is, change and renewal is always possible.